It's a longstanding myth that white wine does not need aeration. The new Vinturi for white wine dispels that myth. 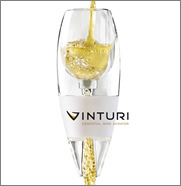 Vinturi White Wine Aerator - Designed exclusively for white wine, it uses a different air to liquid ratio than the Red Wine Aerator.Travel bag/pouch included for easy transport. Vinturi comes in sturdy gift box and also includes a no-drip stand.Acrylic aerator and stand are dishwasher safe. The travel pouch is machine washable. Logo etching now available! A minimum order of 48 glasses is required for logo etching, and you can mix and match between the red and white Vinturi. No stand required. You just hold the Vinturi aerator over the glass or decanter and pour the wine through. Air is pulled into the wine; instantly opening it up. The Vinturi is that fast and simple. Includes stand and travel pouch.